Resources | 3-D Change, Inc. Complexity Works! 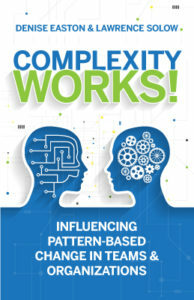 Influencing Pattern-Based Change in Teams and Organizations. 2016. “The Industrial Revolution provided many tools that have made our current way of life possible. With over 100 years of success, they became the assumed, natural, “correct” ways to to make change happen. For all of the benefits those tools offer, they are no longer sufficient to address today’s complex systems and organizations. There are too many variables; too many changes happening too quickly; too much change — to believe every issue can be deconstructed, decomposed, analyzed, prioritized, and the “one best, guaranteed way” implemented to address all of that complexity. What Works for GE May Not Work for You: Using Human Systems Dynamics to Build a Culture of Process Improvement. Productivity Press, 2010.